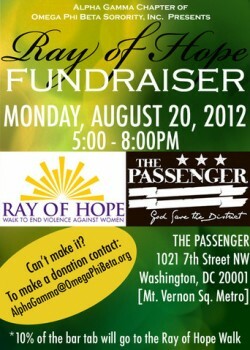 The Alpha Gamma Chapter of Omega Phi Beta Sorority, Inc. invites you to a Happy Hour to raise funds for the Ray of Hope Walk to end violence against women Monday, August 20th. 10% of bar proceeds between 5pm -8pm will benefit the walk. See all of the week’s events here. To add your event, click the events tab up top and then click “add an event”. You can add concerts, museum/gallery exhibits, fundraisers, sporting events, bike rides etc. You can add anything you think will be of interest to PoPville. City Vista’s SweetGreen Opening Wed.